Although most of our combination padlocks are suitable for outdoor use, this model is designed specifically using a stainless steel shackle and non-corrosive internal components for added environmental protection. It is therefore also highly secure and resistant to force attacks. Each padlock has a 4 digit pin number resettable to you choice of code using a special security key preventing anyone from changing the combination at a later stage. 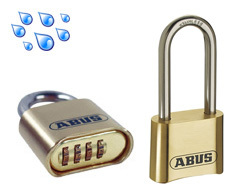 On our website we have one size of popular weatherproof combination padlock. 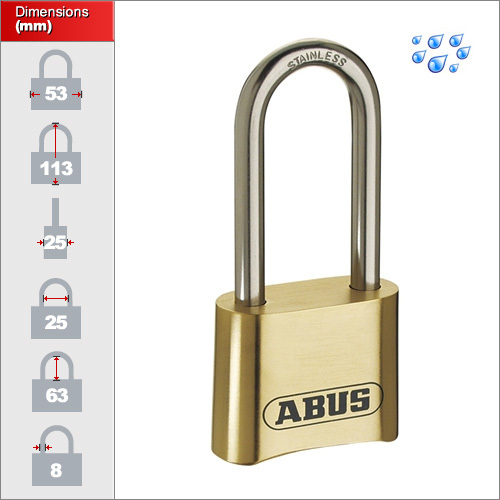 This padlock is ideal for outdoor use on gates, boats, containers, compounds and any other situation where it will come into regular contact with the elements. 2. Push shackle firmly down and lock will open. 3. Take key and insert into the side of padlock, feeling as you push against the spring mechanism. 4. When the key will insert no more, turn 90 degrees left or right. The key will turn easily. If you have to apply force then you have not inserted the key correctly. Remove and start step 4 again. 5. With the key remaining in the lock, set your new desired code. 6. Now turn key to the original position and remove. The lock is now reset to your code. 7. To close the lock, push the shackle down to the locked position and scramble the numbers. 8. To re-open, input your new code and push down firmly on the shackle.